A commission makes great and memorable, one of a kind gift for weddings, anniversaries, birthdays or ‘just because’. They’re also great if you just want to hang a fun painting of your favourite pet/s on your wall. 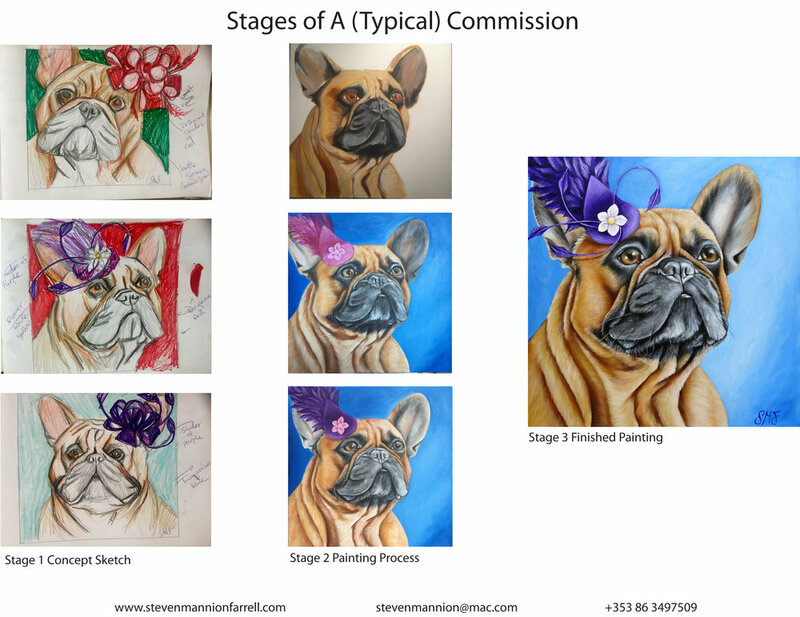 If you’d like to commission a painting simply send an email to stevenmannion@mac.com outlining what you’re looking for and we’ll then come back to you with some information about the commission process and an estimated cost and timeline. For pet paintings, between 5 and 10, high resolution images of your pet is required. If the commission is of more than one pet, up to 5 photos of the pets together will be needed for scale. If you’d just like a painting of a specific breed of dog, that’s fine too, just let us know in the email and we’ll give you all the options. Whenever possible, Steven is more than happy to come meet your pets and take photos. This callout usually takes 1-2 hours and a callout charge of €140.00 can be paid (in advance) online once a time and date is agreed upon. This initial consultation does not obligate either the client or the artist to commit to a commission. International callouts are charged on a case by case basis and include business class flights and hotel accomidation. Once a client is happy to go ahead with a commission a 30% (nonrefundable) deposit is paid and the painting process begins. If a client would like to include precious or semiprecious stones (on a dog’s collar or tiara for instance) the initial quoted price will be amended to reflect this and a further deposit may be due.